HELSINKI - Where there is dust, there is the problem. In bulk and powder handling, dust accumulations or nuisance dust is major problem. Operators are often relying on a visible dust cloud to give them information that something is wrong. More often than not, dust control in today’s industry is well handled and when everything is working as it should, dust levels are at acceptable levels. Unexpected events are also a part of everyday life in industry and when handling bulk and powders these unexpected events often cause undesired dust clouds. These undesired dust clouds will usually have site specific consequences. Regardless of the industry handling bulk and powder, dust seems to be the single most common headache. The reason why to measure dust will vary a lot depending on the variables of the type of dust. Health and Hygiene: The inhalation of most any kind of dust is very bad and often hazardous to health. Employers around the world should be doing their best to quickly be able to react quickly to unexpected dust events. Proof of compliance: In most countries globally, stack and emissions monitoring has been regulated so companies are forced to abide. However, what about all of the secondary emission sources? We are seeing that more and more often; regulators want to see proof that companies are monitoring their secondary sources. Unwanted dust accumulation: the dark corners of the plant often get the least amount of attention and often are not under the radar of operators. What about the dust accumulating? In some cases, it’s a great party for rodents, bugs or microbiological organisms. In other cases, if accumulated dusts were to disperse into the air and combust, the consequences could be fatal. Fugitive dust: The dispersion of dust into the local vicinity is often a cause for conflict between plant owners and the public. In one case the owner of the very expensive yacht becomes extremely annoyed to find a coating of dust on his much cherished yacht. In another case, the plant owner finds that his fine metal dust and the light of rain damaged the paint of all the cars in the nearby parking lot –giving them an expensive new project of repainting the cars. Hazardous location supervision: All companies handling explosive dust understand the tedious task of area classification. Nevertheless, by installing continuous dust detectors, they can prove they made the right decision and it will also give the information to change if necessary. Sintrol manufactures high quality, low maintenance dust monitors for the detection and monitoring of dust concentrations. Historically the most common applications for Sintrol dust monitors have been inline industrial dust measurement solutions for process control, filtration leak detection and emissions monitoring. The years of experience in high dust industrial environments and a proven measuring technology brought the development of the DUMO, a unique ambient air monitor that can withstand the high dust concentrations sometimes present in factories. 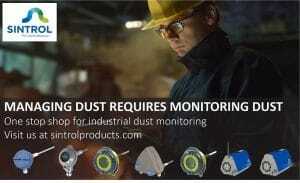 24/7 dust monitoring in high-risk areas will immediately alert operators when abnormal dust levels are detected. If there are abnormal dust levels, it will allow the operators to define the source and areas and react quickly. No longer do plants have to depend on operators to notice a dust cloud to alert of possible events. When working with bulk and powders, companies will usually have numerous precautions, policies, procedures and equipment in place so that when they all work together, it will maximize safety. Real time dust monitoring for the detection of upset dust conditions can be a safeguard to help live with unavoidable nuisances. Good housekeeping practice and confidence in dust management should be the norm. Manual grab samples have their place, but it is time for operators to stop relying on them as their primary method of measuring dust. The future of dust monitoring is automated, continuous and real time.